Re-casting contemporary global concerns and issues in the language of "spiritually-engaged sustainability" (SES). This initiative will attempt to generate a SES discourse. It will also attempt to generate a new language with a new set of concepts to re-name and/or re-signify the worlds we live in. 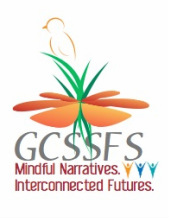 While GCSSFS will periodically share position papers, it will also share ideas and initiatives of many others (individuals and organisations) who are contributing to such a discourse. Many of the ideas that will be featured here are not necessarily the views of the Centre (it fact many are not) but they being shared here to encourage engagement, discussions, dialogue, re-thinking (by re- questioning) and re-orientation. We urgently need a new language, symbols and narratives to emotionally and intellectually build a new orientation that can contribute to designs of more sustainable worlds for this and future generations. Please Note: The highlighted items below are active. This is work in progress. Links will be added. Those of you who like to help in this effort, may contact me here. Any help to improve or strengthen this effort is welcome. The highlighted topics below are active and growing. The other areas are being researched. Your contribution is welcome. The categories are not mutually exclusive . They can also be expanded to cover very specific areas.